Approchez-vous des pyramides majeures de Dahshur, Saqqara et Giza lors de cette visite privée de deux jours, dirigée par un égyptologue qualifié. Ensuite, visitez les sites du Caire, notamment les antiquités du musée égyptien, les mosquées et les églises de la Citadelle et le bazar Khan El Khalili. Vous dînerez dans un restaurant surplombant le Grand Sphinx de Gizeh et monterez un chameau sur le plateau de Gizeh; regarder un spectacle de lumière et de son; et participez à un dîner-croisière sur le Nil avec des danses du ventre et des derviches tourneurs. Assistez à un spectacle son et lumière et observez la danse du ventre et les derviches tourneurs lors d'une croisière sur le Nil. Our 2 day tour in Cairo was by far the best ever. Besides offering so many of the key highlights of Cairo and Giza and Saqarra, we were so lucky to have an amazing tour guide Yasser and driver Ala for both days and Ahmed for the night tours. 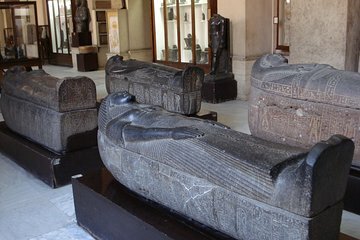 The 2 day tour gives you everything you would want to experience in the area and more Pyramids, Sphinx, Cairo Museum, Papayrus factory, sailing down the Nile on a Falucca, a dinner cruise with a belly dancer show, touring the most famous Mosque in Cairo, a Coptic church and a synagogue and of course the Markets to shop. The people are so welcoming and we always felt safe.Our Guide Yasser was a wealth of knowledge and he speaks about 5 languages fluently. He was energetic, funny and great company too! The guides have to know about 3000 years of Egyptian history and pass a test to be able to be guides. Our driver Ala picked us up both mornings at our hotel and our guides, Yasser and Ahmed stayed with us wherever we went even at lunch or at the light show in the evening. We were also able to change up the schedule of the day depending on how we were feeling or what we wanted to see. We had an amazing time and would recommend this amazing experience to anyone thinking of coming to Egypt. Cant wait to come back and see them again in the future! Worth every penny! Took the tour with my wife and we both enjoyed every bit of it. This tour was well organised and we got to see all the main attractions. Our experience was made even better by our very knowledgeable guide Manar and driver Hashem. We felt safe and well taken care of at all times by both. We highly recommend anyone travelling on a short stay to Cairo to book a tour rather than trying to navigate this very busy city where crossing the road can be a nightmare, its best to be guided professionally. This tour was absolutely AMAZING from start to finish. With a very limited amount of time, I was able to see the highlights of Egypt and by the end I was so sad to leave. I was accompanied by an awesome, professional and fun team (day guide, evening guide, and driver) Manar is an incredibly knowledgeable and passionate Egyptologist (and great photographer, I might add!). Basem was the best driver and navigated the crazy Cairo roads like a pro. Because of my departure flight, my tour had to be cut short so I was going to miss the dinner cruise but they surprised me and arranged lunch on the boat instead!! Overall, I cannot recommend this tour more highly. It made my trip to Egypt unforgettable. Don’t think twice - take this tour with Manar and Basem! To sum this tour up in a few words... crash course on Cairo in 2 days. Our guide, Khaled M was personable, professional, knowledgeable and accommodating as he led us on a journey through Egyptian history and culture old and new. This tour allowed me to cross off almost all of the items on my must-see- while- in- Cairo- list, and then some. You will return to your hotel exhausted from your activity filled day, but fall asleep happy that you got your money's worth and excited for the next day's adventure with Khaled. Last but not least, I'd be remiss if i didn't mention our driver Yasir, who expertly navigated the streets of Cairo. He was always waiting with a smile to welcome us back to the cool van and put us at ease with his safe driving and friendly demeanor. If you're considering this tour, but are unsure... DO IT!... and ask for Khaled M and Yasir! You won't be disappointed! A most enjoyable couple of days! Our visit in Egypt was short but not short of seeing and enjoying what Egypt has to offer. It was easy, stress free and all was taken care of by our tour guide Zenab and the driver who were both very friendly and accommodating to our requirements. We enjoyed every minute of what this two day tour had to offer. It was set at a most comfortable pace with many options offering a diverse experience. The pyramids, the museum, the markets.....all were absolutely amazing! The lunches were great. The Nile cruise dinner was very entertaining and the Felucca on the Nile was very relaxing. Our afternoon breaks including the sound and light show at the Sphinx were great. Zenab ensured at all times we arrived on time to events to ensure we had the best seating. She constantly enquired about our preferences and advised us accordingly to ensure we experienced what we preferred the most and her knowledge about Egypt... provided a better insight to our trip. A most highly recommended tour! Our tour was absolutely perfect. Our guide, Zenab, and our driver, Yasser, were both so kind and welcoming. Zenab had so much knowledge to share and was great at sharing it in manageable amounts, so we weren't overwhelmed with the amount of history. Any questions we had were answered and she was always willing to share more. She managed our time well and had many options if we had a little extra time. This tour gives you a lot of flexibility to customize as you like. I travel very frequently due to work, and use Viator to schedule tours very often when visiting new areas. I have been everywhere from the Grand Canyon to the Great Wall of China, but seeing the Pyramids in person was one of the most incredible sites I have ever seen. This tour with Ahmed Eraky was one of the best I have ever taken. I say this not only because of the sites, but he was one of the most knowledgeable tour guides I have ever had. He tailored the experience to meet my interests, and provided in depth answers to all of my questions. This tour get's my highest recommendation! Khaled was very knowledgeable and always offered interesting insights or side stories. We can feel that he loves his work and put great effort to offer a great experience. The tour is well balanced and is a very good value for the price. The shops we visited always had an interesting presentation of their craft and had quality items, not the usual cheap touristy stuff. As a side note, he is very good at taking well-framed pictures, which is a nice bonus. This tour was absolutely spectacular and worth every penny! Our guide Mahmoud he prefers his nickname Hoka and driver were friendly and professional. Hoka was very knowledgeable about every site we visited, drip feeding us interesting information throughout the tour. Traveling with him was more like being given a tour by a friend than a tour guide. He is even an excellent photographer and took many fantastic pictures of us at every place we visited, suggesting great locations and creative poses he is even great at capturing the elusive jumping shot. His knowledge was the most obvious when we visited the Egyptian museum, where he navigated us through the many rooms of artifacts giving us details about even the tiniest ancient toys. Being two ladies traveling alone, we never once felt uncomfortable, and had a fantastic time! I highly recommend this tour, and if you get lucky enough to have Hoka as your guide, you are guaranteed an incredible experience!